SmartyCam HD has been designed for motorsports, by people exactly like you, who have spent their life on the track. This camera was designed with a single purpose to provide great videos that include all the technical information that will help you improve your performance. All this comes in the most robust and reliable system ever. You are on the starting grid, ready to sprint, your adrenaline reaching the climax: the last thing you can worry about is switching on the camera. The SmartyCam HD is aware of that, it switches on/off automatically and starts/stops recording the same way. Engine rumble causes vibrations, which are not a good thing for video recording. Never again will you experience that seasick "wave effect" you get when watching videos recorded by a generic camera, when the car rolls at 7000 RPM. A lens specifically designed for motorsports must be robust, must be able to work when the engine rolls 100 times per second, and have good resolution and brightness. But above all a lens designed for motorsports must reduce distortion, which is a typical problem of lenses used by generic action-cameras: objects placed at ten meters' distance look very far, making it impossible to accurately determine whether the track is straight or curved. The SmartyCam HD telecentric lens with six elements reduces distortion to the minimum and will withstand track vibrations for years! On-board cameras are to be installed inside the car. Where should the display be placed to check the correct position of the camera? The SmartyCam HD 128x128 pixel TFT color display is on the front, not on rear - where general cameras place the viewfinder. HD cameras competition is focused on the highest pixel number. The result is that their video files are far too large, taking too much memory. 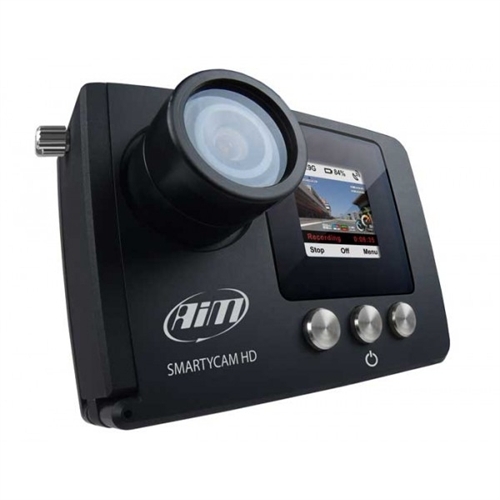 The SmartyCam HD videos have the same quality as other HD cameras but their files are smaller because the H264 compression system parameters have been optimized to a perfect balance between video quality and file size. You can choose among three video file quality levels. Frail things have a bad time on track. 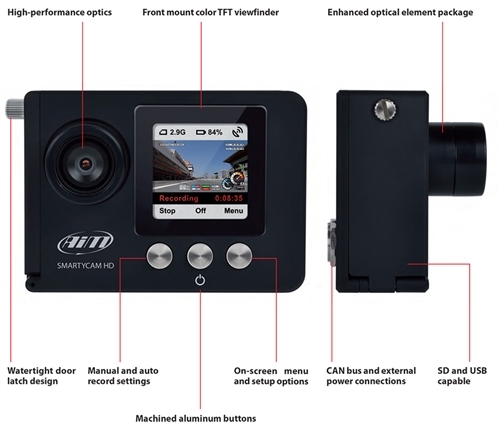 An on-board camera designed for motorsports must guarantee great resistance against the extreme working conditions typical of track racing and against the most adverse weather, such as: strong and prolonged vibrations, storms, continuous rain, and extreme high and low temperatures. This camera is made in machinery molded aluminum, just like many competition car parts.